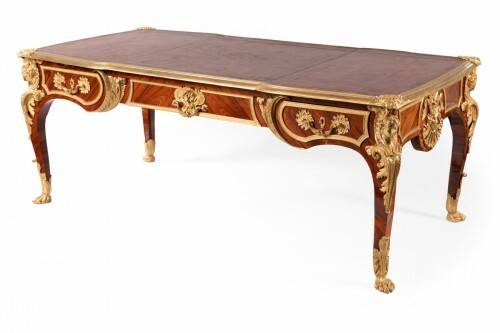 Outstanding Louis XV-style flat desk in violet wood veneer. It opens by five drawers and stands on curved feet. Leather topping. Beautiful gilt bronze ornamentations which reached the top of decorative art at the end of the 19th century. 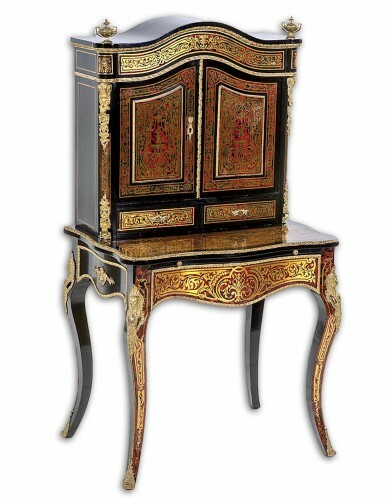 Considered the finest French cabinet maker of the late 19th and early 20th century. Linke was born in Pankraz Bohemia. By 1875, Linke established his own small workshop at 170 rue du Faubourg St. Antoine. 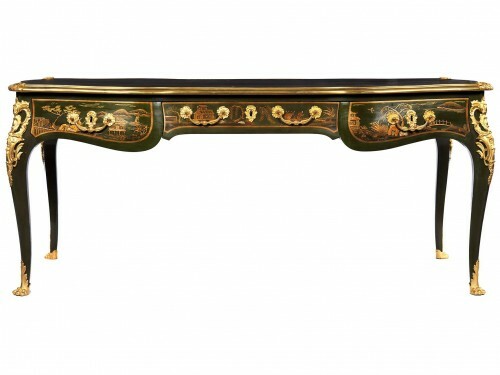 Taking 18th century styles as his starting point and adapting earlier styles to contemporary taste, Linke produced fine quality furniture, steadily expanding his business during the following 20 years. He firmly established his reputation after receiving a gold medal at the Paris Universal Exhibition of 1900 for his extraordinary Grand Bureau. He continued to use international fairs as a means of exploring new markets, exhibiting at the 1904 World's Fair in St. Louis, the Liege in Belgium and the 1908 Franco-British exhibition in London. Linke's highly original designs sprang from the Régence and Rococo styles but were imbued with something quite new - Rococo curves were laden with gilt-bronze sculptural mounts in the tradition of A.-C. Boulle (1642-1732) or Charles Cressent (1685-1758). Linke's greatest successes were achieved during the years after 1900 and up to the beginning of World War I. He opened a showroom in the fashionable Place Vendôme and business flourished until World War II, although the popularity of the old regime styles already started to decline. Linke died at the venerable age of 91. Stamp: Engraved signature: “F.Linke”, “FL” , “LINKE”.